ASUS is the worlds first manufacturer to unveil their FM2+ motherboards lineup for the next generation of Kaveri APUs. 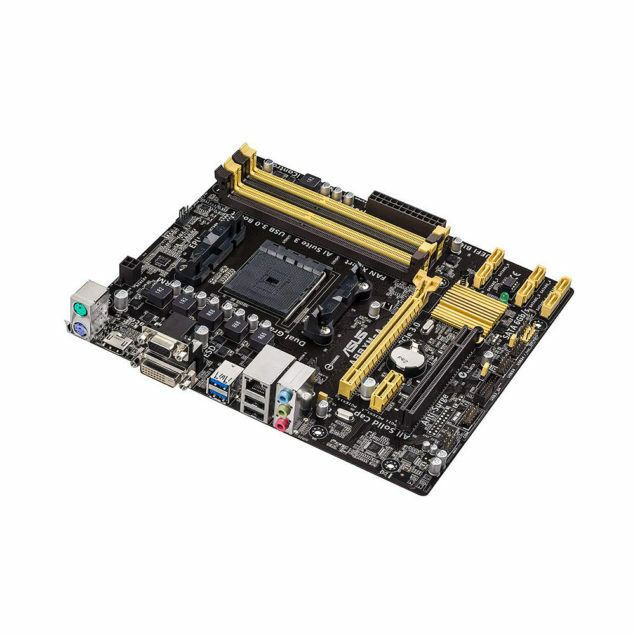 The new FM2+ motherboards from ASUS include the A88XM-A and A55BM-A motherboards which feature the FM2+ socket to support AMD’s current and upcoming generation of accelerated processing units. Before getting to know the boards themselves, it should be noted that FM2+ socket is backwards compatible with Richland and Trinity APUs while also offering support for the next generation Kaveri APUs. This would allow users currently using the Richland or Trinity A-Series to upgrade to the FM2+ platform with ease. The FM2+ boards by ASUS feature their latest gold and black color theme which was also featured on their Z87 legacy lineup. The A88XM-A features the A88X chipset and a 3+2 Phase PWM supply that is powered through a 4-Pin connector providing juice to the FM2+ socket. There are four DDR3 DIMM slots on the motherboard which support memory with frequencies of upto 2133 MHz and 64 GB capacity. 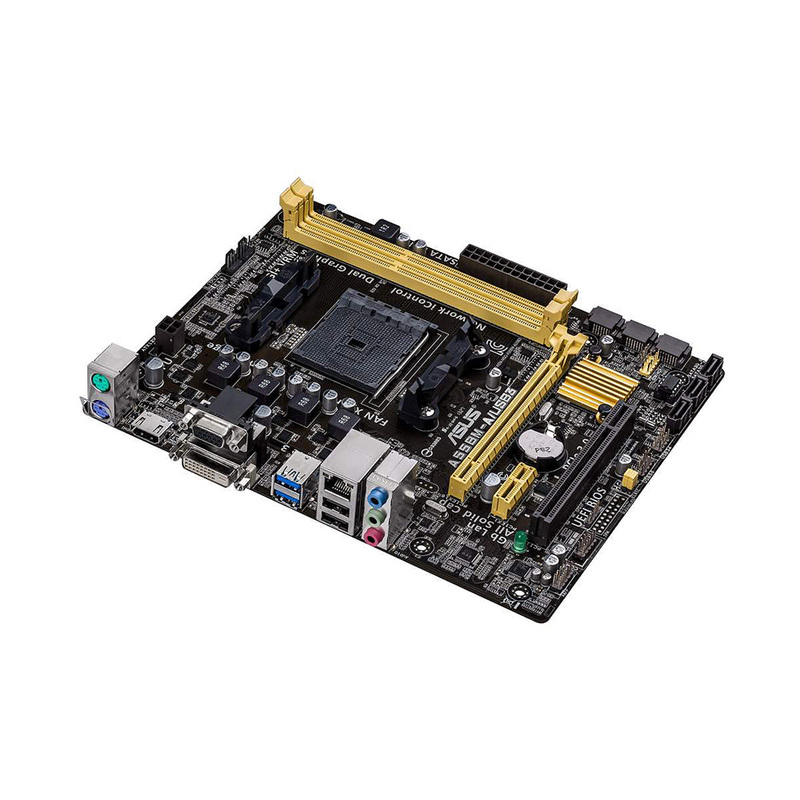 The motherboard features an DiGi+ VRM with solid state capacitors to provide greater stability and efficiency. For storage, the motherboard offers six SATA 6 Gbps ports while expansion slots include one PCI-e 3.0 x16, PCI-e 3.0 x1 and a legacy PCI slot. The I/O panel includes 2 USB 3.0 and 2 USB 2.0 ports along with HDMI, VGA, DVI ports, audio jack, Gigabit Ethernet connector and a pair of PS/2 ports. The second board in the ASUS FM2+ motherboards lineup is the A55BM-A featuring the A55 chipset and a 3+1 Phase DiGi+ VRM. The FM2+ socket is powered by a 4-Pin connector, motherboard offers four DDR3 DIMM slots offering support for upto 32 GB of memory with frequencies of 2133 MHz. Storage includes 3 SATA 3 Gbps ports while expansion slots are offered in one PCI-e 3.0 x16, 3.0 x1 and a legacy PCI slot. I/O panel includes 2 USB 3.0 and 2 USB 2.0 ports along with HDMI, VGA, DVI ports, audio jack, Gigabit Ethernet connector and a pair of PS/2 ports. While these are the first motherboards based around the FM2+ socket, these certainly aren’t the top boards in ASUS’s FM2+ motherboards lineup as we have already seen the A88XM-Pro FM2+ board that was display by ASUS at Computex 2013 and more are to arrive before AMD launches Kaveri by the end of this year. To learn more about AMD’s Kaveri APUs, head over to the page here.